Stir the pot – no, not the chili – the exercise that is touted as one of the best core exercises on the planet by Canada’s own top spine researcher Prof. Stuart McGill, should be considered as an addition to your workout routine as soon as possible (after consulting a health practitioner). 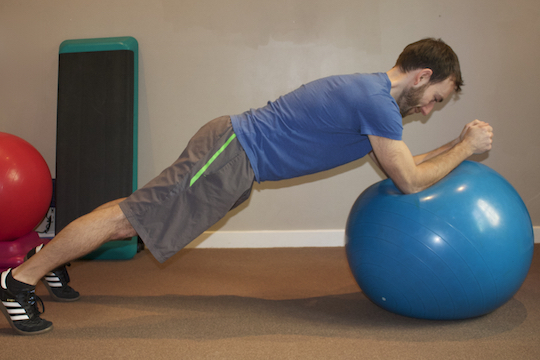 Stir the pot puts dynamic strength and stability demands on your core, with muscles such as rectus abdominus, transversus abdominus, and internal and external obliques firing to keep the spine and pelvis in a neutral position while you balance on a Swiss (exercise) ball. One of the key aspects of this exercise is the somewhat unpredictable movements the spine will perform while the body attempts to keep balanced on a unstable surface. Compare this to a plank on the ground (planks are still great! ); the ground is not moving, and is not going to move, and your body and spine know this. This forces the muscles to activate, but it is in a predictable fashion. Compare this to an unstable surface such as the exercise ball, which represents a real time scenario of, for example, getting out of a car. Your spine has to bend forward into flexion, rotate, laterally bend, and then extend while standing up straight. Unless in an acute stage of low back pain, most people don’t think about stabilizing specific muscles to do this motion, instead, they just do it. In dynamic training with “stir the pot”, we attempt to put your core in a situation where it reacts to unpredictable stability demands on the fly, more like a real time situation. Reiterating that planks are a great exercise, as is side planks, superman’s, and a tonne of other core exercises, consider adding “stir the pot” to your exercise routine after consulting your favourite health practitioner at Vitality! Have a great day and contact myself, Dr. Lucas Tisshaw or Dr. Crysta Serné at Vitality Clinic, to discuss a core stabilization program that is tailored specifically for you.